Great for storing your 2 part and kalkwasser chemicals. We also used these containers from OXO to make our Kalk Dripper Kit and they worked great. Watch the video to learn more. 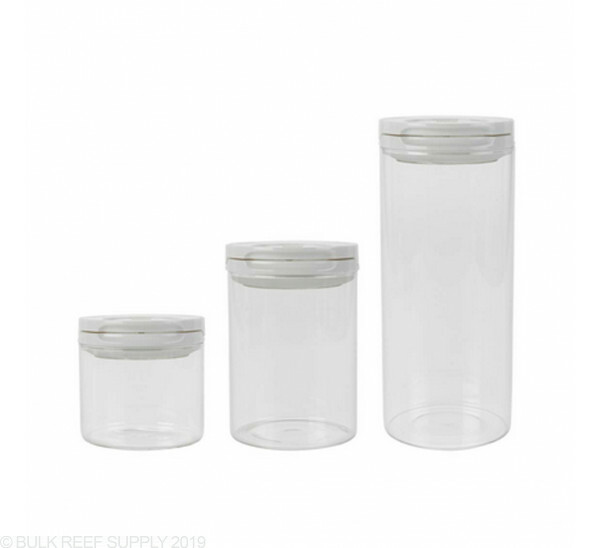 Purchase the 3-piece set for one 0.5 Qt, one 1.6 Qt, and one 2.5 Qt! I used a 3/4 hole saw on a drill press and it worked perfectly to cut a hole in the lid for a bulkhead. First, add tape to the top of the lid to help prevent cracking. Turn lid upside down, position under drill and then fill lid with water. Water will help cool the plastic and make it easy. Hold lid and slowly advance the drill bit down applying very little pressure and letting the drill do the work. Continue until hole is made. Very smooth hole resulted. I also drilled a 1/16 hole in the same manner on the lid for venting. Installed 1/4 push connect bulkhead and added ridged tube for in the container and a Mur-lok stem adapter 1/4 tube x 1/4 hose stem on the top side. This piece allows for tight connection between bulkhead and Neptune Systems flexible tubing. Had to heat the end of tube up and added a wee bit of silicone to the barbed stem to get the tube on. Push the tube on while positioning the other end against a solid object to apply pressure. In all, this look awesome and looks to provide a much cheaper and great dosing container. These are by far one of the best options for dosing. The packaging was a little poor when they were shipped originally and one broke in shipping, but BRS immediately shipped another one and replaced it without question. I did use the bulkhead fittings. I unfortunately cracked one of the tops, but honestly I was in a hurry when drilling and was using a wood bit instead of the right tool. Because I had one come in broken though I had an extra and it wasn't an issue. Since installing these I have already had a few friends in the industry say they would be putting them on any new dosing installs for service clients after seeing mine. Great find BRS. The first one I received, the lid was broken. Customer service was terrific and immediately sent out a second one. Unfortunately, with this one, when blowing into it to get the siphon started, the lid would not seal, even tried switching out the gasket from the first one, still no luck. I again spoke to customer service and they could not have been nicer. They offered to send out another one or give me a refund. I choose the refund. With the success others have achieved, I can only assume that there is a manufacturing defect with the latest batch. But, customer service at BRS is the best and I will continue to be a customer. I used this to setup up my dosing containers. My Bubble Magus containers started to leak at the base, and tried to fix them a few times but still kept leaking after a few weeks. I purchased everything I needed from BRS and they are working like a charm!!! I decided to take Ryan's advice and give these a shot. The look nice, will do the job fine, but Dang the are prices. The level lock design is great. As always BRS shipped fast and packaged well/ Thanks for lower the free shipping price, very smart move. I had been using the space saving jugs and wanted something nicer. I went back and forth deciding which containers to use. What sold me on these is that the container is actually sealed versus just a lid sitting on top. The steps to diy these in the how-to video where really easy to follow. If I am using these for 2 part containers and running them on brs dosing pumps, should I have a vent hole in the top? I have the large containers, and I was thinking that by the time most of the solution is used there might be some kind of vacuum effect going on since they seem to be airtight. Any thoughts? You will definitely need to drill a vent into the lid as the vacuum will begin to form immediately and not allow your dosing pumps to draw liquid from the container. A small hole is all you will need. Anybody ever tried a positive pressure kalk reactor with these? I'm looking for a container I can run like a traditional kalk reactor (i.e., input fed via peristaltic pump and goes through acrylic tube into the bottom of the reactor, output is passively pushed out the top). 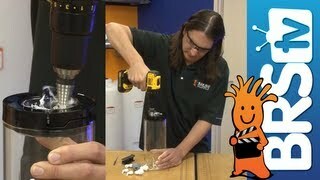 My plan is to use a chem lab stir plate to mix at low speed. The catch is, I need something water tight to a small amount of pressure because the water level needs to go up a few inches (maybe 12 inches height, additional 4 feet of horizontal travel) to get into the tank so I need a seal that will stand up to a little positive pressure. Any thoughts or experience with a setup like this? We have not tried to add too much pressure to the container however it certainly could work well, However a threaded top would be preferred and recommended to deal with the pressure better than a quick release.